On the 13th of January residents of Hawaii were provided with a shocking and terrible reminder of the nuclear anxieties that dominated much of the world throughout the Cold War. By error, the State Government sent a push notification that warned of an incoming ballistic missile strike. Responses varied wildly. One reddit user said that they rapidly resigned themselves to their fate and stayed in bed with their wife. Meanwhile, in a desperate attempt to save his children a man pried open a sewer cover, and lifted them inside. Thirty-eight minutes after the initial notification had gone out, the government finally managed to inform a frightened public that it had all been a mistake. There was no danger. Conversations that cropped up on social media in the wake of this ‘attack’ often bore an eerily familiar tone, echoing similar discussions about civil defence in its heyday during the Cold War. This historical connection provides a disturbing reminder that the threat posed by the massive nuclear stockpiles that have been amassed by nation states remains ever present. While nuclear anxieties had all but vanished from public discourse following the Soviet Union’s collapse, a nuclear sword of Damocles has remained dangling above our heads. This unfortunate reality, alongside some of the major headlines of the past four years, shows that the Cold War has left the world with a long and powerful hangover. The daunting prospect of nuclear annihilation was an ever-present aspect of the Cold War. Divided by ideology and politics, the United States and the Soviet Union raced to create massive nuclear stockpiles. As a NATO ally, and the likely recipient of massive doses of radioactive fallout in the event of a nuclear war, Canada was also subjected to this overwhelming and disturbing reality. Subsequently, from 1948 to 1963, the Canadian government administered a civil defence (CD) program to prepare. This program, at its most basic, attempted to convince families to prepare for the outbreak of nuclear war by stockpiling supplies, building personal shelters, and planning evacuation routes. 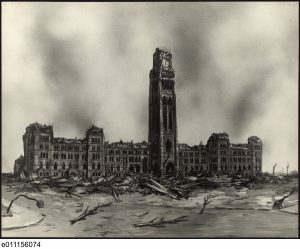 Due to the destructive nature of nuclear arms, government assistance was often required and – somewhat reluctantly – every level of the Canadian government became involved with CD throughout its history. The discussion fostered by this post bore a remarkable likeness to the discourses that surrounded CD. The original poster argued that the false alarm had shown that the state was completely unprepared for a nuclear catastrophe, and that everything possible should be done to ensure the population’s survival. Some came to the poster’s defence, making the important distinction that while preparations for a a full scale nuclear attack were likely to be pointless, preparing for a small scale single missile strike from North Korea could likely save lives. This conversation, well certainly a small example, helps show that nuclear issues have begun to re-enter public discourse, and that the debates surrounding these issues bear an eerie resemblance to earlier discussions. In both cases two arguments quickly emerged: resigned skepticism and an optimistic, if somewhat overly ambitious, desire to prepare. It is important to note, as Martin Pengelly did in The Guardian, that the warning accidently sent out by the Hawaiian State Government only carried relevancy because of increased tensions between the United States and North Korea. Under Kim-Jong Un, North Korea’s missile program has advanced considerably. Experts speculate that the country has been able to miniaturize its nuclear arsenal, making it possible for North Korean missiles to deliver nuclear payloads to targets in North America. Meanwhile, the Trump administration has pursued a hardline approach towards the small nation that has antagonised its despotic regime. While the threat posed by North Korea’s nuclear program is serious, it does not carry the same weight as the hostilities that existed between the Soviet Union and the United States. The fact remains, however, that North Korea’s development of its nuclear capabilities has been an ongoing issue for decades now and the state owes its existence to the binary world system that the Cold War constructed. Furthermore, both the United States and Russia have maintained massive nuclear stockpiles, even as Cold War tensions have faded. Thus, as the world begins to re-absorb the existential dread that thermonuclear arsenals invoke it becomes clearer by the day that the world continues to struggle with the unresolved issues left behind by the status quo of the Cold War. In fact, many political figures continue to maintain geo-political stances that appear antiquated when examined historically. After all, does Putin responding to NATO troop movements in Eastern Europe by announcing expansions to Russia’s Inter-Continental Ballistic Missile program not sound like a headline that belongs in the twentieth century? Nevertheless, daily news has been dominated by headlines that harken back to the Cold War for years now. When viewing the Russian invasions of Georgia and Ukraine, meddling in the 2016 American election, competing American and Russian interests in the Syrian Civil War, Russian incursions into western airspace, or the ominously reminiscent discussions of nuclear preparedness one could be forgiven for thinking that the Soviet Union never collapsed. This reality displays the pitfalls of historical categorization. How can we ever truly state that one era of political or social being has ended, when it is clear that every stage of human history has a profound and clear influence on those that follow? Andrew Sopko is a PhD candidate in History at Queen’s University, working under the supervision of Dr. Jeffery Brison. He completed his MA in History at Carleton under the Supervision of Dr. Norman Hillmer and Dr. Andrew Burtch. He is interested in how Canadian’s emotional responses to threat can reinforce and shape policy and conceptualizations of national identity. His PhD research examines the reactions of Canadian municipalities to the prospect of nuclear annihilation during the Cold War, through their relationship with federal and provincial civil defence efforts. He has given talks about his research for the Ottawa Historical Society and the Diefenbunker: Canada’s Cold War Museum.